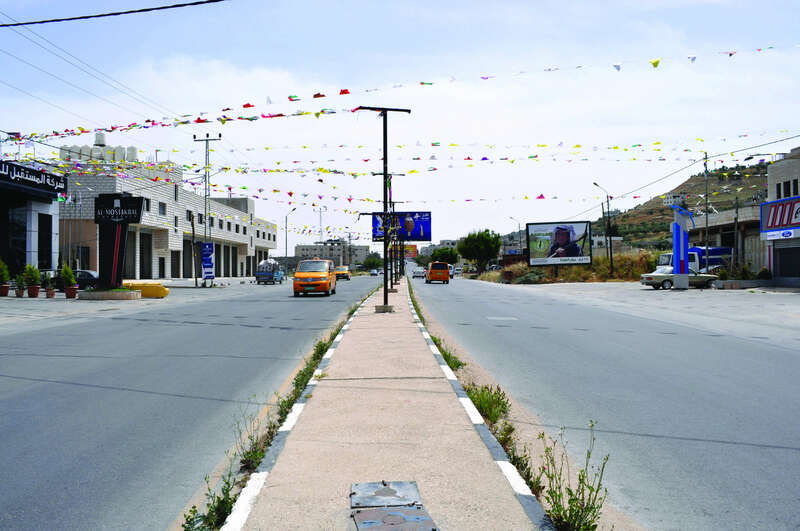 The Road and Transportation Master Plan of West Bank and Gaza Strip is the first comprehensive master plan tackled in PNA since its constitution in 1994. 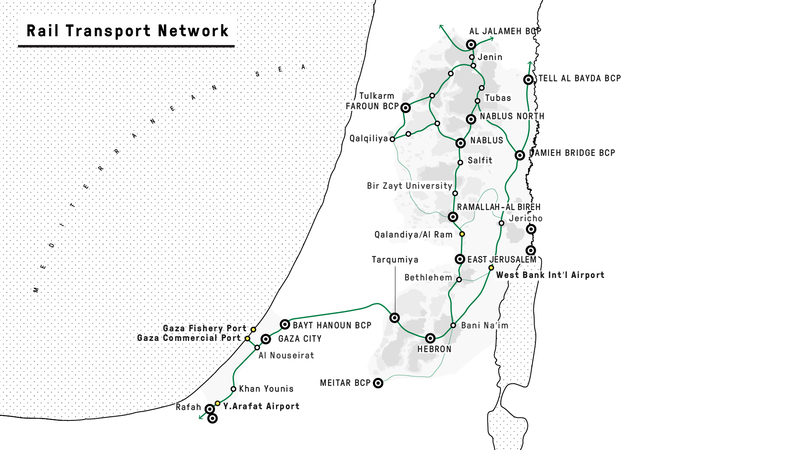 The Master Plan has the overall objective to promote the achievement of a vision for the future of the Palestinian transport sector; in particular, it aims to incorporate equally West Bank and Gaza Strip into a single and united framework, through the definition of a multi-modal transport network and a multi-phased development strategy. The Master Plan includes a Spatial Design Master Plan and an Implementation Program Plan. 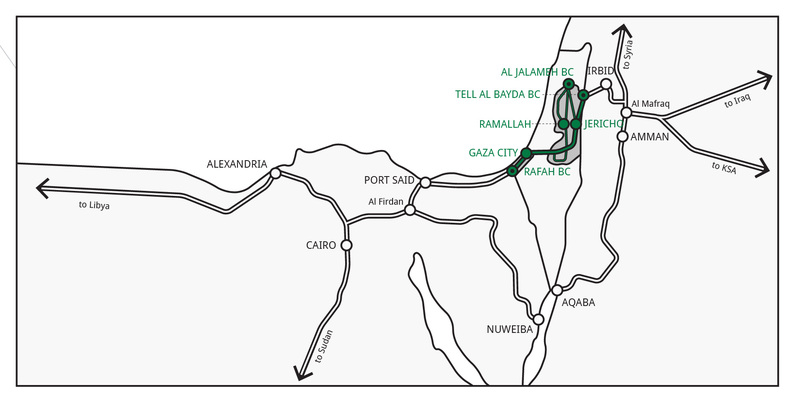 The Spatial Plan includes the proposal for a national territorial corridor between the West Bank (Tarquimiya) and the Gaza Strip (Bayt Hanoun) and involves the following transport sub-sectors, that are tackled in both their infrastructural, operational, legal and financial aspects: Rail Transport; Road Transport; Public Transport; Air Transport; Maritime Transport, and; Border Crossing and Inland/ Freight & Logistics. It aims at improving connectivity at multiple scale: 1) micro-scale (within West Bank and within Gaza Strip); 2)meso-scale (between West Bank and Gaza Strip), and; 3)macro-scale (between West Bank + Gaza Strip with the Region). The Program Plan defines the chronological framework for the implementation of the Master Plan. Together, the Spatial Plan and the Program Plan intend to: 1) identify a short-term investment plan, for an immediate and concrete implementation of priority actions, and; 2) define a transport vision for West Bank and Gaza Strip, that includes all transport modes and participates to the wider renewing process of transport sector. 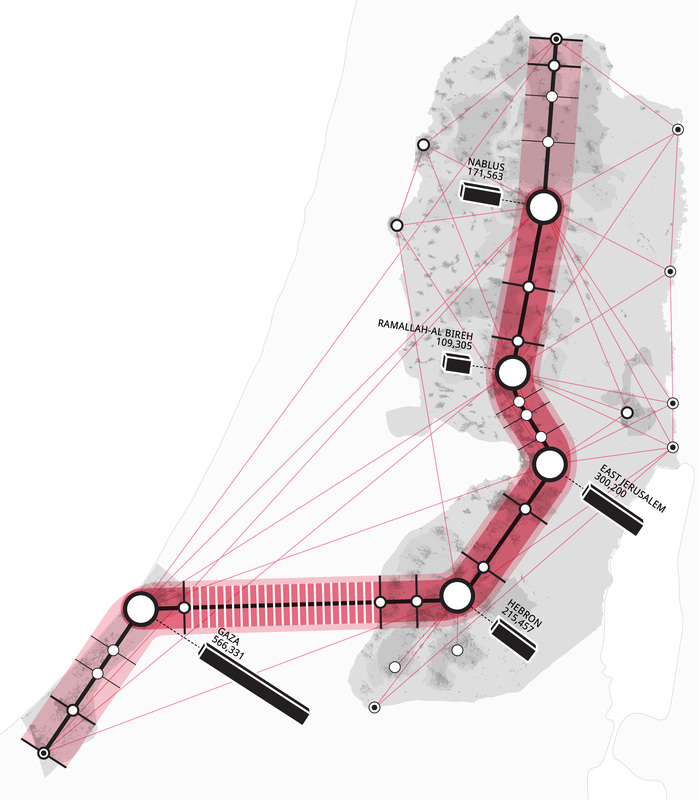 The Master Plan’s general proposal consists in: 1) the definition of a North-South multi-modal backbone (rail+road); 2) plus a set of secondary East-West axes; 3) the creation of new multi-modal infrastructure equally and strategically diffused along West Bank and Gaza Strip, and; 4) the realization of new and refurbishment of existing facilities at border crossings, for fastening and boosting freight & logistics. 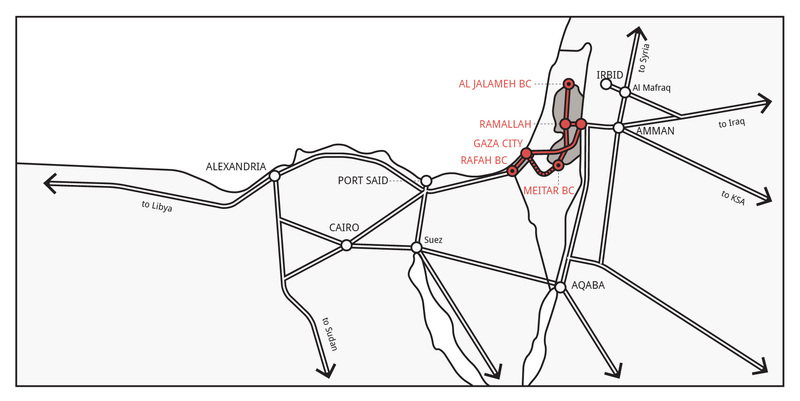 In particular, two main railway lines are proposed: an international line, from Rafah Border Crossing in Gaza Strip to Al Beyda new Border Crossing in West Bank; and a national line, serving the main urbanised areas of the West Bank, between Al Khalil/Hebron and Jenin. A refurbishment plan is proposed for the fishery port in Gaza Strip and a new commercial port is proposed in the southern outskirts of Gaza City; likewise, a refurbishment plan is also proposed for the damaged airport in Gaza Strip while in West Bank the reopening of Qalandia Air Field and a new international airport in the Jordan Valley are proposed. 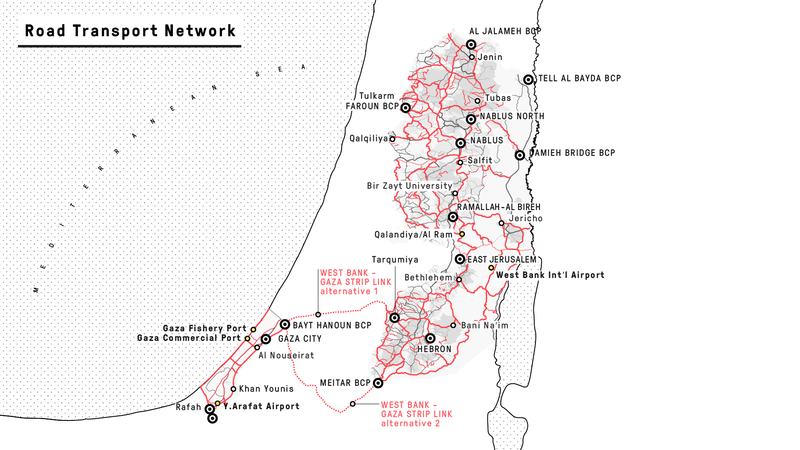 Finally, public transport network including BRT systems are proposed in the major Palestinian cities, namely: Bethlehem, East Jerusalem, Gaza City, Hebron, Nablus, and Ramallah. For the first time since the PNA was instituted in 1994, a common and integrated transport strategy is defined for two main Palestinian Regions: West Bank and Gaza Strip. A short-term investment plan, for an immediate and concrete implementation of priority actions, is identified, within the long-term strategy. The Master Plan will leave a significant legacy of information and local specialists who improved their competency and acquired new skills thanks to specific training courses specifically organised.